And one day to say everything I need to say. How could I possibly, in a five minute presentation, communicate the nuances of the 14 conversations I had with fishers up and down the Oregon coast? How could I make sure that they weren’t being misrepresented by my words, since some voices would disagree with others? Would the audience–which I knew would mostly be comprised of people in the biophysical sciences–understand the relevance of this type of work? These were the doubts rolling through my mind leading up to Friday, August 17th–the Oregon Sea Grant Summer Scholars Final Symposium and, coincidentally, my 22nd birthday. Never before have I designed a scientific poster, let alone present my scientific work in front of people who weren’t my peers or professors. As a dancer, I have been on stage hundreds of times. I know that chemically in the body, the feelings of excitement and anxiety are essentially the same. Cortisol levels spike. Your heart races. The last thing you want to do is wait. The only difference between these emotions is whether you are interpreting the situation in a positive or negative light. These feelings are not unfamiliar to me, but they caught me by surprise last Friday. All thirteen scholars–who I have come to adore over these past 10 weeks–were coming together one last time. My work, which was shared and understood within a small circle, was finally going to take the stage. I was exhausted from traveling long distances and preparing my materials. And I had high expectations for myself on this significant day. But I would not have it any other way. Excited and shaky, I took the floor in front of a standing room only audience. I briefly explained the place of human dimensions research in environmental policy. In my words, it boils down to analyzing a particular situation through multiple social sciences lenses at different units of people. Economics, anthropology, sociology, and psychology all contribute to a holistic understanding of the world. I explained how my research dealt with individuals rather than groups of people or geographical regions, and what that looked like. I remember hearing a few empathetic gasps when I said I reviewed 785 written responses to a well-being survey four times over. And exclamations of surprise when I showed them the complex framework I used to assess how people think and what they value. 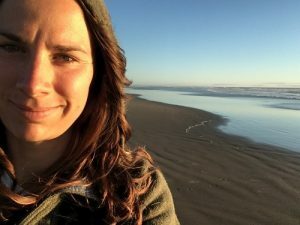 I explained that being trained to think this way set me up perfectly for what I was brought to Oregon to do in the first place: to interview fishers on their perspectives of the marine reserves. For if you can’t get to the root of what people care about, you lose all potential to find common ground. 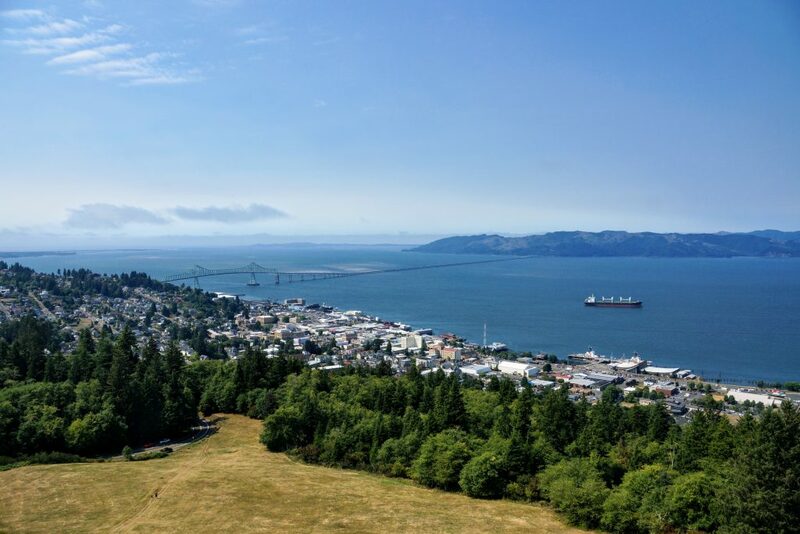 Looking over Astoria–the northernmost point in my journey–toward my home state of Washington. At this point in the presentation I felt myself balancing the need to stay on script for the sake of time with the desire to deviate into stories. 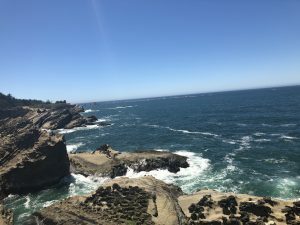 I drove over 1060 miles this summer for interviews–which is the equivalent of driving the Oregon coast three times over. 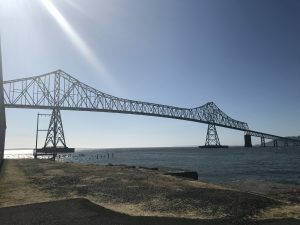 I conducted interviews from Astoria along the Columbia River to Brookings, which is nine minutes from the California border. Each and every person I talked to had distinct backgrounds and countless stories, and were more than open to talk about their lives as fishers, challenges related to fisheries management, conservation, and the marine reserves. I can honestly say that my perception of fishers has changed radically since coming to Oregon. They are highly satisfied with their lifestyle and are in tune with the natural environment that their business depends upon. Many of them wish to collaborate with scientists and managers to create policies that serve the greater good, so long as their input is not used against them. These insights are just a snapshot of what I ascertained from 20 hours of conversation. But what I couldn’t tell the audience was about everything that happened in between these conversations. Moments punctuated by extensive beaches, meeting new people, and exploring the Oregon coast. Places referenced in interviews that I had the privilege of seeing with my own eyes. And the coastal cultures that my mentor Tommy introduced to me–I got to feel those firsthand. Traveling as a part of the Human Dimensions Project helped me understand the people of the Oregon coast more so than reading could ever do. Haystack Rock at Cannon Beach, where I stayed for three days while conducting interviews on the North Coast. 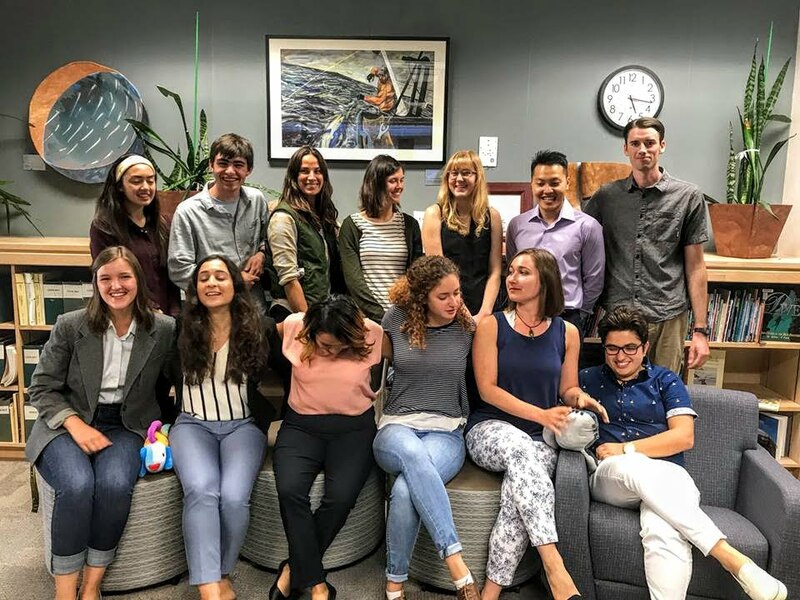 For example, when I spent one weekend traveling to the North Coast, I was introduced to fellow Summer Scholar Dylan Rozansky’s work environment at the Haystack Rock Awareness Program (HRAP). 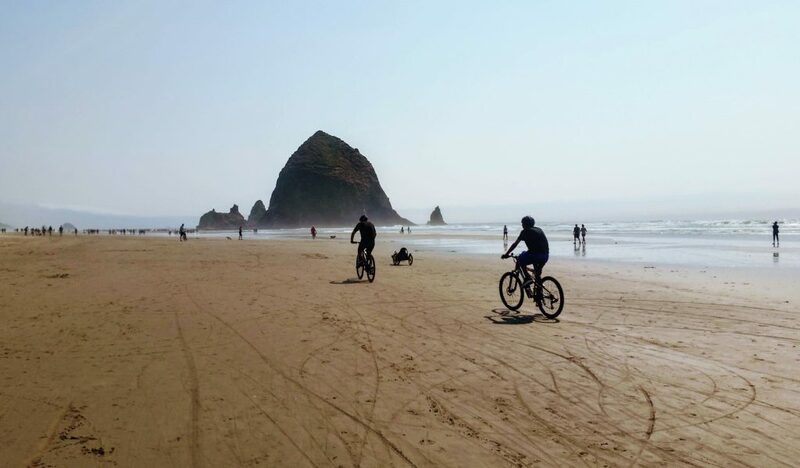 On Cannon Beach, a whole community comes together to educate visitors on the ecology of Haystack Rock and to ensure its protection for the future. The Historic Bayfront of Florence, one of my favorite places on the Oregon coast. However, it’s a really hard call to pick favorites. I feel so lucky to have traveled the entire coast this summer, and to have been exposed to so many different, beautiful places. On a sunny Saturday morning I interviewed a fisher in Florence–a quaint retirement community an hour south of Newport. I took the time to wander through art shops and happened upon a bead shop called the Waterlily Studio, whose products are based out of appreciation for the natural history of our planet and cultural uses of nature. I loved everything about the shop, and then got into a conversation with the owner about the future of our world. Our fears with the Southern Resident Killer Whales (SRKW’s) in the Puget Sound, and what we can do to save them. 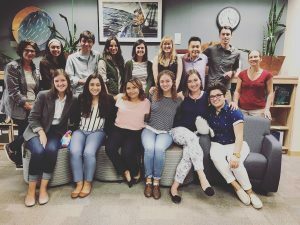 And I was more motivated than ever to take everything I have learned this summer–about engaging people in conversations and marine policy–to do something about this. When I return home to Seattle this Sunday, attending a public action meeting on the fate of the SRKW’s is one of the first things on my agenda. 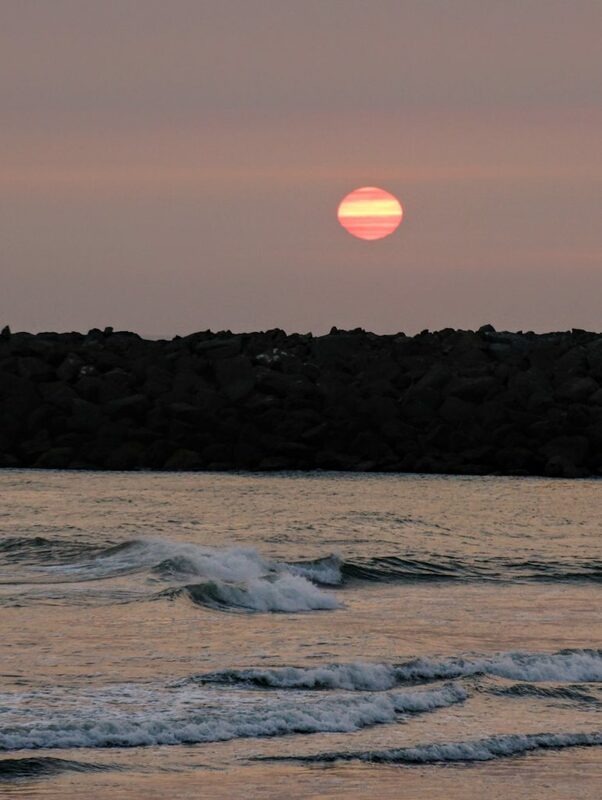 A blood red sun in the smoke of California fires. I stayed in Gold Beach on the Rogue River while conducting South Coast interviews. I am feeling a lot of things in this present moment. It is bittersweet to leave this incredible slice of the world. And already, so many of the Scholars have moved on to the next chapter of their lives–whether that be school or jobs. And I wish them all the luck in the world. Of all the emotions in my heart, I feel grateful to have been entrusted with this work, to have had such supportive mentors, and to have met such an outstanding group of people. My people, my fellow Scholars. Oh how I will miss you. The marine science community is small enough, so I have faith our paths will cross soon enough again. It’s hard to believe the summer is already winding down. I had a wonderful time in Oregon and learned far more than I thought nine weeks could offer. 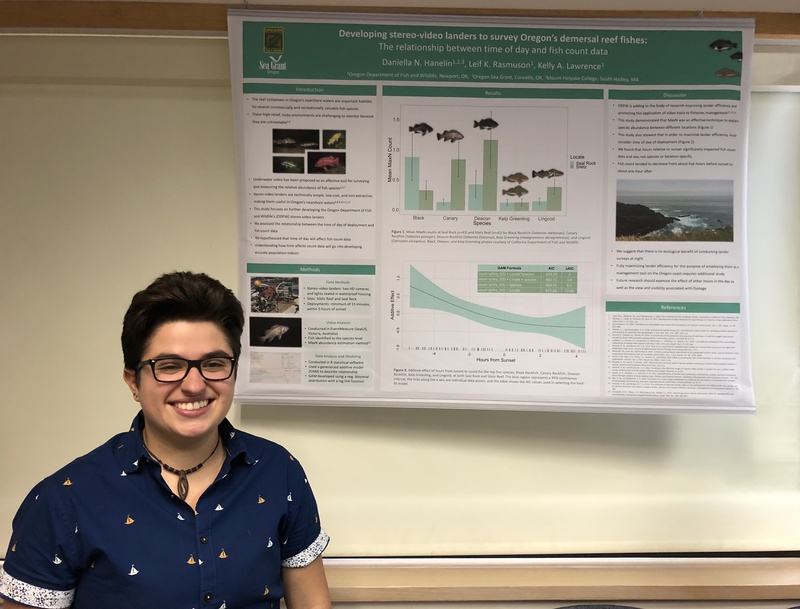 From learning all the nearshore Rockfish species to the ins and outs of R and basics of statistical ecological modeling, I have gained a variety of technical skills that I’ll carry with me throughout my career in the marine sciences. 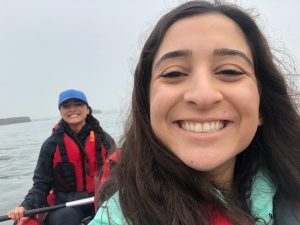 Working at ODFW this summer has given me insight on what it’s like to work as a research fisheries biologist in a government agency and how important a biologist’s work is to fisheries management. After hours of testing and running models and decoding error messages in R, my data began transforming from a stream of numbers to a story. We found that hours from sunset had a significant impact on fish count data, and it was neither species nor location-specific. Using what is called a generalized additive model (GAM), we were able to show how all our variables interact with fish count data and suggest that there is no ecological benefit to conducting surveys at night. 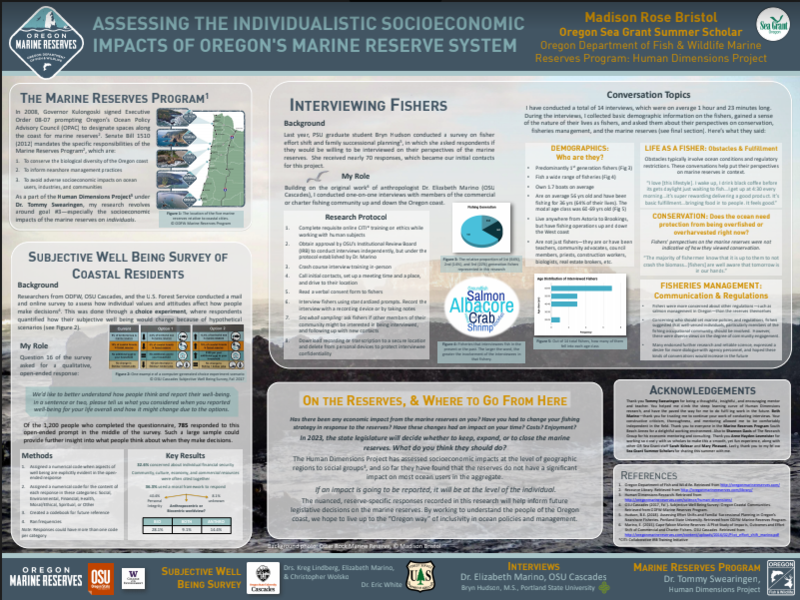 My work is part of a larger project the ODFW research team is working to complete, so I’ll likely be the author of a publication relatively soon! On Friday, all the scholars came together to share their work and experiences working in various marine fields this summer. This final symposium consisted of short presentations followed by a poster session, and I would say it was one of my favorite parts of the summer. Seeing all the relevant, complex work people were part of reminded me just how powerful, inspiring, and intelligent our generation of rising scientists is. We have the power to be effective communicators and dissolve the barriers between science, policy, and human dimensions. We have the power to make change and show others the importance of protecting our oceans. I’m excited to see how all the scholars apply the knowledge they’ve gained this summer and where their experiences and passions will take them. A big thank you to everyone who supported me on this journey to the West Coast – it was a first, but it certainly won’t be a last. In my last blog post, I introduced you to the excitement Newport offers outside of Hatfield Marine Science Center, but left you hanging on how the mesocosm project turned out. We planned on running experiments three days in a row, leaving the mesocosms out in the field for the entire duration. We needed to collect over 360 juvenile Dungeness crab and over 18 Pacific staghorn sculpin, which proved harder than we expected. We quickly saw that we would need to adjust our study due to the natural progression of second instars growing into fourth or fifth instar crabs. The crabs were too large for the Pacific staghorn sculpins to eat, making it difficult to run a predation experiment. However, we realized that the large crab size could be a benefit as it would allow us to study the crabs’ behavior without any predation while also reducing a factor of loss when retrieving the crabs. This increase in crab carapace allowed us to reduce the number of crabs needed to 10 per mesocosm instead of 20, another benefit. 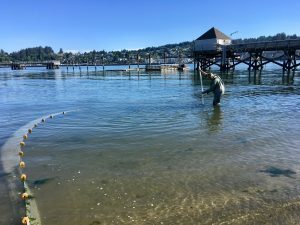 We spent three days beach seining at low tide and setting minnow traps overnight to collect the necessary number of organisms. Brett Dumbauld of USDA-ARS beach seining for juvenile Dungeness crab and Pacific staghorn sculpin in Yaquina Bay, OR. Water tables in the EPA lab housing over 250 juvenile Dungeness crab and over 40 Pacific staghorn sculpin. With all of the pieces together, we were able to move forward and set-up the mesocosms in the field to begin running experiments. 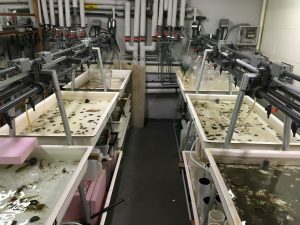 The mesocosms were set the same as they had been during the first trial, each containing different combinations of two habitat types (on-bottom oyster aquaculture, eelgrass, open mud) in three controls and duplicated in three treatments. An example of a mesocosm set-up. 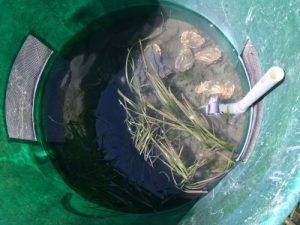 One side contains eelgrass, the other oysters placed to mimic on-ground oyster aquaculture. We then prepared the Pacific staghorn sculpins by starving them for 24 hours before they were put in the field. We had previously decided that we would experiment with different lengths of time that the crabs were exposed to the sculpin to see if it had any effect on their behavior. We decided to begin one trial when the water was low enough that it wouldn’t be spilling over the top of the mesocosms (about 2.5′). This trial was run for 2 hours, wherein predators were left in the mesocosms. We then reset the trial by removing and counting predators and prey before adding more organisms for a 24-hour trial which we would come back to the next morning. As we approached the mesocosms that morning with the water just around the tops, we noticed them rocking back and forth. NOOOO! How were we going to run our 24-hour experiment without the crabs and sculpins escaping? We ran back to Hatfield during our 2-hour wait period and brought back a drill and rebar to reinforce the mesocosms, hoping it would do. Since we already had the organisms prepared, it was best to run the 24-hour experiment and just see what would happen. Kelly Muething and Anna Bolm clearing out the different habitats after a 24-hour habitat selection experiment involving juvenile Dungeness crab and Pacific staghorn sculpin, in Yaquina Bay, OR. We had some pretty interesting results. In the 2-hour experiment, we retrieved 95% of the crabs while in the 24-hour experiment we retrieved 106% of the crabs. This was the opposite of what we expected since the mesocosms had been rocking, but apparently some other crabs had run in rather than escape. Given that we only ran two trials, we can’t conclude any real results, but did see some patterns. Crabs preferred oyster shell over both eelgrass and open mud, whether or not there was a predator. 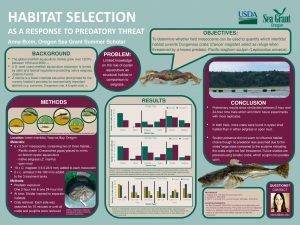 The sculpins’ presence didn’t seem to have much impact on crab habitat selection, possibly because they had outgrown the sculpins’ ability to prey. All in all, the mesocosms were a success and Brett plans on using them again next summer, earlier in the crab season to test the second instars. Last Friday, I presented my work and then participated in a poster session, a really rewarding experience. It felt good to share what I had been working on and I appreciated the exercise of thinking about how to communicate the project to others. It was also informative to see what the other Sea Grant scholars had been working on as well as converse with scientists about our work. Poster shown on the mesocosms at Oregon Sea Grant poster session. It’s been a really incredible summer living and working at Hatfield Marine Science Center. I am very grateful to have been given this opportunity and feel lucky to have had such wonderful mentors to work with. 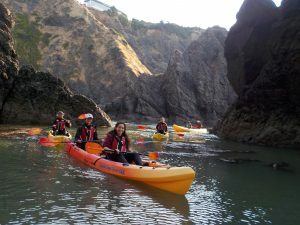 To celebrate the end of the summer and completing the final presentation and poster session, my husband guided me out on my first sea kayaking trip, exploring the sea caves beneath Cascade Head. Rising and falling with the swell is an incredible feeling, the water looking like hills around you. 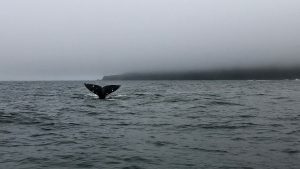 We watched a whale play about 100 meters away before heading into a cave. I have to say, it was pretty scary and amazing at the same time. Paddling into darkness with waves booming around you would spook anyone, right? It was cool seeing all of the birds nesting along the rock cliffs, Pacific sea nettles swimming around, and sea stars and anemone exposed at low tide. We also spotted some floating tubes which turned out to be squid eggs. All in all, the perfect end to a perfect summer and a reminder of how much we love the area. We’re hoping to move to Newport so I can continue volunteering and learning at Hatfield while looking for work. Wow, how the last nine weeks have flown by me. To start this post, I want to present a sample of the analysis I was able to draw from the survey data. In terms of basic demographic data, 75% of the respondents were female and fifty percent of those surveyed lived outside of Oregon. Over ninety percent of people also identified as Caucasian. While my coworkers and I can tell you that an overwhelming percentage of those who visit Haystack Rock are Caucasian, in reality it is probably less than ninety percent – probably closer to 75-80%. 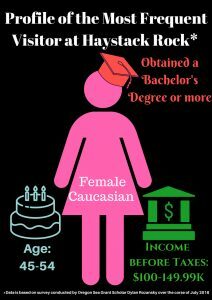 Both this stat and the idea that three out of four visitors are female might be attributed to a few different factors. For one, I was the only person to conduct the survey, therefore I, myself, may have inadvertently introduced some bias. To counteract this and create a random sample pool, I should have asked others to also conduct the survey. We also receive visitors from all around the world so one possibility for the extreme difference could be those visitors who do not speak English as a first language may have felt timid about talking to me or taking a survey which was not in their primary language. Our organization has tried to increase our diversity with the hiring of an inclusivity coordinator who has translated some of our brochures and information into Spanish while also running a program which allows people to check out beach wheelchairs for free. The other piece of analysis I will touch on is just how much Haystack Rock is a family activity. When I first arrived and learned from other HRAP staff that we did have visitors who returned, it made sense to me, yet I did not comprehend the degree to which people return to the Rock. I found that more than 35% of tourists had visited the rock not just once, not just twice, not even five times, but ten or more times! Reading through the comments and having conversations with people from areas all over the US, I came to learn that many people have returned to Haystack Rock year after year. Some have family reunions here every year, some live in Washington but make the trek down at least once a summer, but all felt a connection to the Rock. To share the demographic data from the survey with our partnering organizations, I created an easy-to-read infographic. 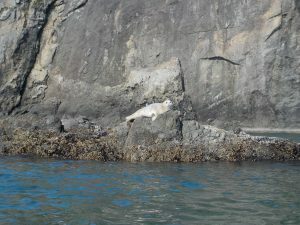 It is this connection that I think could be the key to protecting Haystack Rock and its inhabitants. People who have not visited in a few years are shocked by the drastic reduction in sea star population from even three years ago and many are clearly concerned by the fact that it is possible their children, or grandchildren, may not get to see the mosaic of sea stars that at one point painted the area. For humans to see what effect we have had on our environment is crucial to building a bridge towards conservation. A few, certainly the minority, citizens of Cannon Beach and Tolovana Park, as well as those who make the pilgrimage almost yearly, believe HRAP enforces too much. In their mind, if we do not allow a child to see what happens when they poke a closed sea anemone, or look at the underside of sea star, or look for nudibranchs on their own instead of an interpreter pointing one out to a child – all of which they would have done as a child before HRAP was established – we are stunting their growth and inhibiting their naturally curious side. I choose to tell the visitor that if we do not recognize that the ways of the past have left us where we are today, and if we do not learn from the past’s mistakes, we are bound to repeat them. This aside, I am constantly amazed at the number of guests who do want to see the puffins, as well as their avian and aquatic neighbors, thrive at Haystack Rock. Personally, this summer has been incredible. It was the first time I was more or less living on my own, while simultaneously working my first 9 to 5 job. I learned how to cook with modest supplies…and not have a dining hall to bail me out when I was not in the mood for cooking. For the most part, the food I made was pretty good, and I believe I did a decent job crafting meals that covered most of the food groups. Given that I had a decent amount of down time after work and on the weekends, I had to figure out what to do. Hiking became my go to and I will sorely miss not having jaw-dropping hikes within a ten to fifteen minute drive of my place. Oregon never ceased to amaze me with gorgeous coastal views, dense coniferous forests that were shrouded in a heavy fog during my morning hikes, and colorful bridges (no, really, for a kid who has spent time in Denver and Miami, this last item was a highlight). 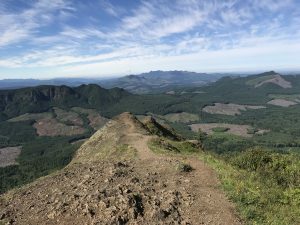 The view from Saddle Mountain on a clear day cannot be beat! 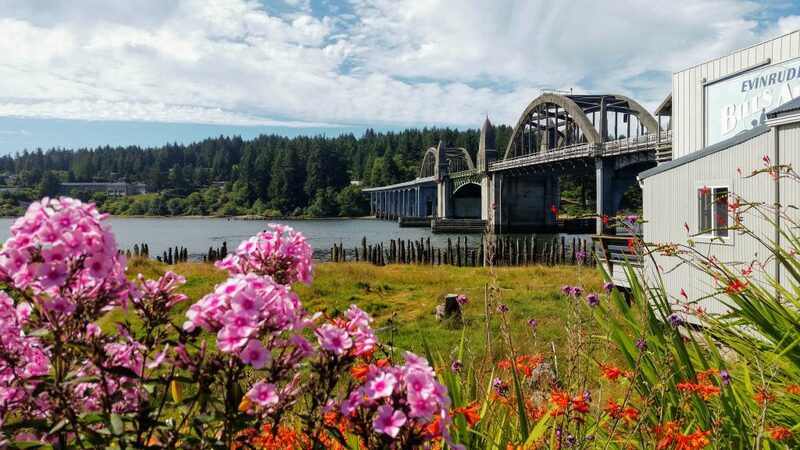 Crossing the Astoria-Megler Bridge and stepping foot in Washington was a summer highlight. I have to mention my coworkers who made our small office a great deal of fun and could always make me laugh, while simultaneously teaching me crazy facts about marine life and just about anything else, too. 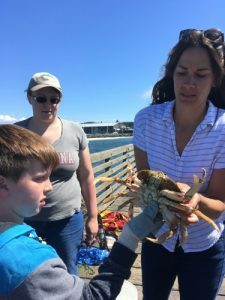 My standards for professional conferences were significantly increased this summer when most of our staff traveled to Portland for a week at the Northwest Aquatic and Marine Educators (NAME) conference. I had the opportunity to spend a week with amazing people from Alaska, British Columbia, Washington, and Oregon, many of whom are (or were) educators in high school, universities, and community colleges. Both inside and outside of the conference that week, our boss, Melissa (who also happened to be the coordinator for the conference), ensured that we had a fantastic work environment, and there truly was never a dull moment. These people made the quiet Oregon coast a whirlwind of activity, engagement, and welcomed me to their community. I will miss them, every one of them, a lot. 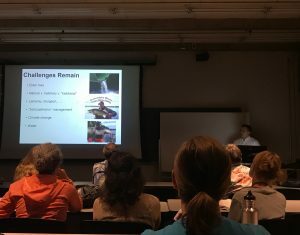 This summer I was able to attend the NAME conference and learn what great work is being done in the area of marine education in the Pacific Northwest. If someone asked me if they should apply and try to be a part of Oregon Sea Grant, I would emphatically say “yes” as it is a professional experience that teaches you so much and connects you with knowledgeable people, all while giving you the opportunity to spend a summer in a state that has more to offer in terms of unique culture (I am looking at you Portland Timber’s Army) and outdoor activities than can be completed in ten weeks. 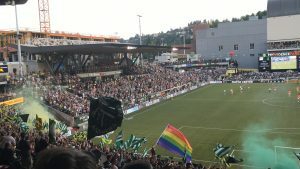 One of the most energetic fan bases of any professional sport, in my opinion, is the Timber’s Army. After realizing the summer was quickly slipping away, I spent the last three weeks exploring Newport and soaking in what it has to offer. 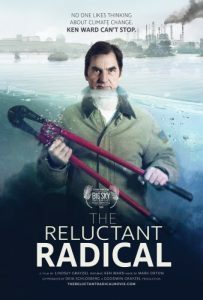 There was a free screening of the documentary, Reluctant Radical, at the Newport Performing Arts Center followed by a Q&A with the director, Lindsey Grayzel, and the subject of the film, Ken Ward. The film offers the perspective of father and eco-activist Ken Ward by following him through: blocking the Shell icebreaker from leaving Portland Oregon, shutting down the U.S. tar sands oil pipeline, and the trial following his arrest. When framed by the fear of his son’s future given current oil consumption, Ward’s actions make sense. To view the film you can find or host a screening at https://www.thereluctantradicalmovie.com/ . I also participated in the NOAA fish cutting party which was a huge success!! Three days were scheduled for fish processing but a great early turnout of volunteers cut the processing time in half. Over 1900 fish were processed, which included removing the stomachs and otoliths, as well tags and fin clips in some. While I have gutted and filleted fish before, searching for otoliths was a whole new challenge. Otoliths, tiny little ear bones the size of a sesame seed, slip from your tweezers in the blink of an eye escaping to a mess of brain and tissue. It was easy to become immersed in the search and all the more satisfying when the little piece was found, especially knowing the otoliths were being used to age the fish by counting growth layers like rings on a tree. Up at a nearby café, Café Bosque, my roommate and I spent an evening with Ranger Ryan talking about marine debris along Oregon’s coast. He presented a slide show on the subject and then screened Chris Jordan’s Albatross the Film while providing commentary along the way. I am currently working on research outside of my Sea Grant project which investigates the presence of microplastics in seawater and zooplankton and it was nice to see the combination of art and science to help communicate such a hidden yet ubiquitous issue. 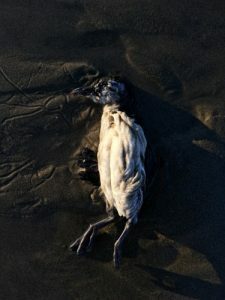 A photograph, inspired by Chris Jordan’s Albatross the Film, of a bird I spotted while walking along Nye Beach. The film documents the dying albatross population on Midway Atoll. Jordan dissects multiple birds to find their stomachs filled with plastics. I went and checked out the historic Nye Beach neighborhood which was filled with live music. There was a band playing outside the Newport Visual Arts Center, another at the Taphouse at Nye Creek, and more at Nana’s Irish Pub! Nye Beach is a cute little area with a lot of shops and restaurants near the beach. I ended up taking my visiting family there for breakfast at Cafe Stephanie where we all had delicious breakfast burritos and complimentary scones. I also finally made it to the Saturday farmers market with my roommate, where I stocked up on berries, salad, and tomatoes. There were so many good smelling food stands serving prepared food that next time I’ll have to remember to go hungry. Later that day, my roommate and I went crabbing on the public dock. We sat out in the sun, reading our books, and chatting with fellow crabbers for about four hours. We had some exciting catches of a couple Dungies that were just a little too small to keep. We ended up with 3 Red Rock crabs but realized we wouldn’t be around for dinner, so passed them along to our neighbors. The crab that was JUST too small. My roommate Meg is to my left and a little helper who offered to throw it back for us. While my brother and sister-in-law were visiting we checked out the Aquarium Village, then went for a hike in Wilder, followed by a beer at the nearby Wolf Tree Brewery, and topped it off with dinner in Nye Beach. It was a lot of fun showing them around and exploring new places at the same time. 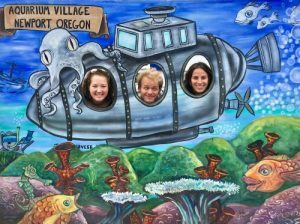 Family fun at Aquarium Village, diving into the deep unknown. I am currently soaking in a little more Newport by eating some clam chowder I made from cockles gathered in Yaquina Bay. I have to say, it was a lot of work shucking and cleaning the cockles, but it is the best clam chowder I have ever had and am already planning when I can get back out and harvest more. In other news, my summer project is complete! We ran the last experiment on Friday, but you’ll have to wait until the next blog post for all of the details. Me in my happy place, at Nye Beach. 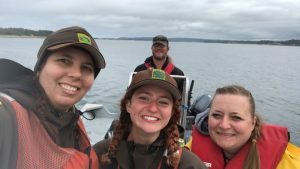 This summer I’ve been a part of the Shellfish and Estuarine Assessment of Coastal Oregon (SEACOR) team, a program of Oregon Department of Fish and Wildlife. 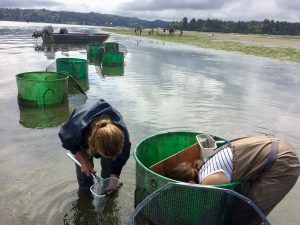 This shellfish program conducts surveys to estimate bay clam abundance in estuaries on the Oregon coast, this summer’s field work is in Coos Bay. Recreational clamming is a popular activity amongst locals and tourists in Oregon, commercial clamming is sold mainly as bait for Dungeness Crab fishers, supporting livelihoods. Our work is to ensure that this fishery is sustainable by suggesting conservative quotas for commercial clamming and daily catch limits for recreational. When I began as an intern I dove into field work, my first day consisted of basic boat operations (which I knew none of), dredging randomly computed GPS locations, and filling in data sheets of habitat characteristics. It wasn’t until a couple of weeks in I could see the big picture and importance of the work we were doing. 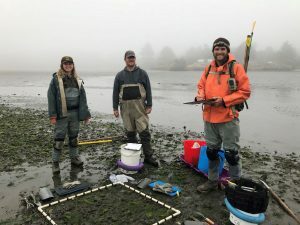 As an intern I’ve been given opportunities to be a part of more than my teams immediate work, such as participating in an ODFW shellfish creel survey, a Cockle clam survey, shadowing water quality monitoring specialists, learning how the work and research ODFW does contributes to policy making, and community outreach events. That first day as an intern I could only see the clams and crabs in front of me, sorting them is only one component of it all. I have two weeks left in Oregon and I’ve begun to think how much I will miss my team, Coos Bay, and the work I’ve been given. The employees I’ve had the pleasure to work with at ODFW are genuine, lively, and hardworking people. I don’t get sick of being on a boat with them 5-10 hours a day, they’ve made me realize it may be hard to find a job where I am as happy to be at work as this one. I am so lucky to have been accepted as an Oregon Sea Grant Summer Scholar.